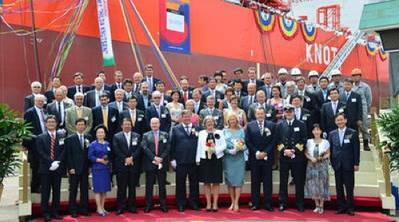 Knutsen NYK Offshore Tankers AS (KNOT) (headquartered in Norway) in which Japan's NYK has a 50% share, held a naming ceremony for two 'winterized' DP2 tankships under construction at Hyundai Heavy Industries shipyard. The two 123,000 dwt Suezmax shuttle tankers, which are equipped with a class 2 dynamic positioning system and a bow-loading system, were named Hilda Knutsen and Torill Knutsen. The first-named will be delivered at the end of July 2013, and Torill Knutsen will arrive at the end of September. 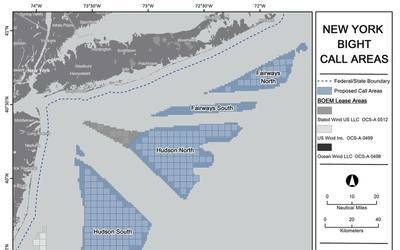 The vessels will be chartered by Eni Trading & Shipping S.p.A (headquarters: Rome, Italy) for a maximum 10-year period and will be used to transport North Sea and Barents Sea crude oil ashore. NB: A shuttle tanker, sometimes known as a 'floating pipeline' loads crude oil from floating production, storage, and offloading (FPSO) units in deepwater fields, and then transports the oil to crude-oil storage units or petroleum storage stations on land.